We’d love your help. Let us know what’s wrong with this preview of Playing the Enemy by John Carlin. In 1985, Nelson Mandela, then in prison for twenty-three years, set about winning over the fiercest proponents of apartheid, from his jailers to the head of South Africa' A thrilling, inspiring account of one of the greatest charm offensives in history--Nelson Mandela's decade-long campaign to unite his country, beginning in his jail cell and ending with a rugby tournament. In 1985, Nelson Mandela, then in prison for twenty-three years, set about winning over the fiercest proponents of apartheid, from his jailers to the head of South Africa's military. First he earned his freedom and then he won the presidency in the nation's first free election in 1994. But he knew that South Africa was still dangerously divided by almost fifty years of apartheid. If he couldn't unite his country in a visceral, emotional way--and fast--it would collapse into chaos. He would need all the charisma and strategic acumen he had honed during half a century of activism, and he'd need a cause all South Africans could share. Mandela picked one of the more farfetched causes imaginable--the national rugby team, the Springboks, who would host the sport's World Cup in 1995. Against the giants of the sport, the Springboks' chances of victory were remote. But their chances of capturing the hearts of most South Africans seemed remoter still, as they had long been the embodiment of white supremacist rule. During apartheid, the all-white Springboks and their fans had belted out racist fight songs, and blacks would come to Springbok matches to cheer for whatever team was playing against them. Yet Mandela believed that the Springboks could embody--and engage--the new South Africa. And the Springboks themselves embraced the scheme. Soon South African TV would carry images of the team singing "Nkosi Sikelele Afrika," the longtime anthem of black resistance to apartheid. As their surprising string of victories lengthened, their home-field advantage grew exponentially. South Africans of every color and political stripe found themselves falling for the team. When the Springboks took to the field for the championship match against New Zealand's heavily favored squad, Mandela sat in his presidential box wearing a Springbok jersey while sixty-two-thousand fans, mostly white, chanted "Nelson! Nelson!" Millions more gathered around their TV sets, whether in dusty black townships or leafy white suburbs, to urge their team toward victory. The Springboks won a nail-biter that day, defying the oddsmakers and capping Mandela's miraculous ten-year-long effort to bring forty-three million South Africans together in an enduring bond. To ask other readers questions about Playing the Enemy, please sign up. How does book differ from movie? I'm not going to belabor the point here, as I ususally do. We often act, despite everyone's acknowledgement to the contrary, as if our generation invented racism, homosexuality, godlessness, greed, gluttony, and, sometimes hate. If we don't buy in to that common portrayal of who caued history's woes we sometimes still seem to see these things as "ours to fix" and take ownership where it's difficult to establish who is responsible for what. "We must stop this NOW!" yet, if the problem has lasted f I'm not going to belabor the point here, as I ususally do. We often act, despite everyone's acknowledgement to the contrary, as if our generation invented racism, homosexuality, godlessness, greed, gluttony, and, sometimes hate. If we don't buy in to that common portrayal of who caued history's woes we sometimes still seem to see these things as "ours to fix" and take ownership where it's difficult to establish who is responsible for what. "We must stop this NOW!" yet, if the problem has lasted for centuries, why bring the same arguments and tools to the table that have never worked in the past? Now we sit in ivory towers under white buildings, that look as if someone has set an overturned coffee cup on top of a rectangular whit box, and draw battle lines on paper instead of in the sand. Money becomes blood. Law becomes the sword, and we call ourselves civilized while, in practice, little changes save what one side or the other's needs for a new battle. Try as we might, we look back at our history, in our past, and scour present with fine toothed combs, struggling to find heroes with perfect faces that can be mounted on milk cartons and billboards to show off dazzling smiles. Failing to do that, we make up or own, and post their images, choosing to believe as truths that really came from the darkest imagination in which they had been created. In ignorance, we ignored the true heroes who toil in obscurity to overcome massive mountains of trumped up thought with ages of experience at believing imagined rights and wrongs. Faces that failed the test of photogenics and lighting, or voices that seemed drol and ordinary instead of heroic. While most of us in the US were absorbed in our own misery and joy, either make believe or real, in South Africa from 1985 to 1995 a battle raged. Sometimes the battle involved blood and bone, blade and bullet. Sometimes these battles involved paper and law, authority and anarchy. Sometimes it involved thoughts and emotions, both real and self-cultivated, and, sometimes, politics. This was nothing as simple as a war of guns and bullets, though there was plenty of that to go around, this was a war for hearts and minds. A war over that fragile, illusive thing we choose as our Identity as a person and a nation and the relationship between us. While most of the United states continued about their lives in blissful ignorance, tipping the metaphorical hat at news stories and other odd things in press and on television, the most important battle of our time had been started, fought, and won, steming the tide of bloodhsed, rather than causing more to bleed. It was perhaps the most important battle of all time about human rights and human dignity and the right to life, liberty and the pursuit of happiness with no barriers or glass ceilings decided by the colour of your skin and no privlidges ripped away by an angry fledgling government of wounded victimized warriors. This book reads like a 300 page newspaper article. John Carlin is, after all, a journalist. It starts with a long history lesson, that is as distasteful as it is interesting and wicked as it is wise. In the middle the book turns to a tale of manipulation, cunning and charm. By the end, it's a tale of triumph. A bloodless coup where there were no casualties and the enemy joined the victors in celebration, dancing in the streests...and the rest of the world slept with only a few even registering the importance of what was going on. Our acknowlegement of what had passed held in check our need to have villains and faces to rail at and call shameful names, and make believe heroes to occupy our guilt. This book reads like the weather in Maine. The first part is the cruel winter that seems to last well more than it's fair quarter. A brief spring that is far to short, a blistering summer and a beautiful autum with gold and red leaves dancing in the wind. As they say in Maine, "If you don't stay for the winters, then you do not deserve the spring and summer." Let no man be so foolish as to think that sports, a national sport is only a thing of fancy or a bottle passion for sale to the highest bidder. Surely, those things can happen, but here, the galvanizing agent that started a healthy conversation about how Blacks and Whites in South Africa could live in peace without fear of eachother started with a "A Hoolagin's sport played by gentleman." A brutal sport of Contact and bone jaring collision, amazing speed and skill played by strong men with the hearts of lions. For Whites, as one Rugger in the book put it. "For once we were not the bad guys, everybody's favorite villains. The people were behind us. The whole world was behind us and we felt it. We had regained our dignity after years of being everyone's enemy." For blacks, led by Nelson Mandella, it was a chance to show, that victors are not always vengeful. Sometimes they are thoughttful and caring and understanding of simple pleasures. That your fears of us are not waranted, this is how we prove it. Nelson Mandela is my hero. Rugby is my game (I'm from the South Wales valleys, 'nuff said). Simply the best book I've read all year, it was absolutely awesome. Mandela's methods for disarming and charming everyone were inspirational - this is the only inspirational book I've read (I can't get into that genre at all). I've just been chucked out without notice from a private group 'Back in Skinny Jeans' on Goodreads where some member/s don't like non-Americans, non-Republicans, non-Christians and Nelson Mandela is my hero. Rugby is my game (I'm from the South Wales valleys, 'nuff said). 1994 was a critical year for South Africa. A president had been elected by almost two-thirds of voters in the first truly democratic, one-person, one-vote elections the country had ever had. Tensions were simmering just barely under the surface, not infrequently erupting into violent neighborhood rallies, bloody skirmishes, and even assassination. Many of the white Afrikaner minority were worried about reprisals from the black majority, some of whom were undoubtedly eager for revenge or at least 1994 was a critical year for South Africa. A president had been elected by almost two-thirds of voters in the first truly democratic, one-person, one-vote elections the country had ever had. Tensions were simmering just barely under the surface, not infrequently erupting into violent neighborhood rallies, bloody skirmishes, and even assassination. Many of the white Afrikaner minority were worried about reprisals from the black majority, some of whom were undoubtedly eager for revenge or at least eager to see whites “put in their place” after so long in power. Extremist elements from both ends of the spectrum were arming themselves for what they deemed the inevitable civil war that would come. Even among the more moderate South Africans, doubts that a lasting peaceful government could be forged ran rampant. And then there was Nelson Mandela. Almost three decades of incarceration might be expected to have a hardening effect on a person, particularly when the initial conviction was unjust. However, Nelson Mandela used his time in prison to come to understand his adversary. He learned to speak Afrikaans, studied Afrikaner history, developed friendships with his Afrikaner jailors, and continued to reach out to the government leaders who had put him in prison. Eventually, this approach not only secured his release from jail and his election to the presidency, but also set his country on a path toward equality and reconciliation. Mr. Mandela's optimism, charisma, and determination to engage all South Africans in the process of peace and justice prevailed against the fear and suspicions so prevalent at this turbulent time. And the sport of rugby was his instrument of choice in this extraordinary reconciliation. Good if flawed account of Mandela's struggle to unify South Africa. The author did a good job in showing how tenuous the country was during Mandela's term as president and Mandela"s role in stabilizing a very dangerous period in history. However there are just too many flaws in this book to thoroughly enjoy it. First, there is the formal and stiff writing style of the author. It tends to be unfocused in describing the events. Secondly, while The author sincerely admires Mandela, and there is muc Good if flawed account of Mandela's struggle to unify South Africa. The author did a good job in showing how tenuous the country was during Mandela's term as president and Mandela"s role in stabilizing a very dangerous period in history. However there are just too many flaws in this book to thoroughly enjoy it. First, there is the formal and stiff writing style of the author. It tends to be unfocused in describing the events. Secondly, while The author sincerely admires Mandela, and there is much to be admired, the adulation tends to be a bit heavy. Third, The Rugby part of the book doesn't really become important until the last quarter. This is probably good since I know nothing about Rugby, however I found it more inspiring to read about how Mandela worked with his past enemies to unify a country. In the scheme of things even this Rugby game seeedm to be a bit exaggerated in its importance. This is a good example of the movie being better than the book. 'Playing the Enemy' is one of those non-fiction pieces that you scarcely would have allowed yourself to believe to be true, lest you know it was. It is also one of these texts that you pick up, completely prepared for on subject, and soon you are delivered something that you did not expect. The novel follows the famous south African Nelson Mandela, president, human rights activist and, as accordance to the subject matter of the book, a dedicated rugby fan. The first half, if not more, of the book 'Playing the Enemy' is one of those non-fiction pieces that you scarcely would have allowed yourself to believe to be true, lest you know it was. It is also one of these texts that you pick up, completely prepared for on subject, and soon you are delivered something that you did not expect. The novel follows the famous south African Nelson Mandela, president, human rights activist and, as accordance to the subject matter of the book, a dedicated rugby fan. The first half, if not more, of the book takes the reader on a tour of his life as well as the lives of millions of South African residents as they lived during the time before, during, and have human rights reform in the once turmoil African nation. It tells of the imprisonment of Nelson Mandela, his distinct social power and abilities, and how they eventually led to his release from prison. There is also significant mention and accounts of the social and physical abuse suffered by the blacks under the powerful white government, and how Mr. Mandela was able to persuade them to not retaliate with anger, but with such emotions as love and forgiveness. During this telling, the book is punctuated with 'where-is-he-now' points concerning the life of Francois Pinaar, who would become the captain of the South American rugby team during the 1995 Rugby World Cup, of which the book speaks. Watching the nation of South Africa change was awe-inspiring. From a government headed entirely by whites to a country governed by President Mandela, a black former-prisoner, was a true testament to human forgiveness. The way he dealt with the people around him, of all races and of all intentions, may have been the deciding factor in the fate of his country. As was his attention to rugby, at first shunned by the black population for its connection to the white rule, it was now something that he could use to pull together his people with. All of his people. The South African rugby team prevailed in the world cup, thanks to the support of Mr. Mandela, and 43 million South Africans. The rest, as they say, is history. This is a fantastic novel for all those who want to not only read more on the history of South Africa, the amazing and inspiring life of Mr. Nelson Mandela, but also for those who want a read a book with surprising real events and an ending that will leave you feeling hopeful for the future. Basically put, Nelson Mandela is the MAN. We tend to reduce people to symbols, to say-- oh yeah, him, he's the guy that did this, or she's the "that" girl, or whatnot. And that was basically the nature of my knowledge of Mandela-- a vague sense of his wisdom and love of freedom or something. I don't know if this is the best book ever written about Mandela. But reading it definitely has given me a fuller appreciation of a man I had once thought of only as a symbol. He is a master manipulator, ambi Basically put, Nelson Mandela is the MAN. We tend to reduce people to symbols, to say-- oh yeah, him, he's the guy that did this, or she's the "that" girl, or whatnot. And that was basically the nature of my knowledge of Mandela-- a vague sense of his wisdom and love of freedom or something. I don't know if this is the best book ever written about Mandela. But reading it definitely has given me a fuller appreciation of a man I had once thought of only as a symbol. He is a master manipulator, ambitious, pragmatic. He is endlessly self-aware and self-assured. He is a cosmopolitan world leader. But without doubt, the thing I found most remarkable about Mandela is that he spent 27 years in prison by the decree of a racist white government, yet emerged proclaiming that Afrikaners were "sons of Africa." That he could say such words and mean them signals to me such a depth of wisdom, courage and compassion. In his eyes, the "solution" to South Africa's problems didn't include expelling or taking revenge against whites, but rather meant reaching out to them, forgiving them, and alternately manipulating, forcing, seducing them to embrace justice and true democracy. Nelson Mandela is the epitome of Agile Living and Agile Leadership, which is essentially about living in a way that exercises your freedom and expands freedom for others. Exercising your mental and emotional freedom is the foundation of Agile Living and creating all the other types of freedom that you might want for yourself and the people around you. In spite of having many of his freedoms severely constrained and restricted, and having his loved ones tortured and killed in terrible ways, Nelso Nelson Mandela is the epitome of Agile Living and Agile Leadership, which is essentially about living in a way that exercises your freedom and expands freedom for others. Exercising your mental and emotional freedom is the foundation of Agile Living and creating all the other types of freedom that you might want for yourself and the people around you. In spite of having many of his freedoms severely constrained and restricted, and having his loved ones tortured and killed in terrible ways, Nelson Mandela chose to exercise mental and emotional freedom and to think and feel from a place of love and peace rather than fear, hatred and revenge. And this is in my view the reason he was able to be such a transformational leader. I just love that book!!!! First because it is about rugby, a sport I really enjoy. And also because it is about Nelson Mandela, a man who succeeded to save a country from civil war. He was a hero and a great man. Instead of choosing the easy option and go to war, he made peace with the enemies. I watched the movie first and I really loved it but I didn't know there was a book about it. And when I found it I thought it would talk a lot about rugby but on the contrary! You learn so much more about I just love that book!!!! Otra lectura excelente del 2012, en español se llama "El factor humano". El genio de Mandela para resolver una situación tan crítica en su país y llevarlo a la paz y a la unión es impresionante. La lectura se hace fácil y adictiva (termine en 3 días). Para quienes se vieron la película "Invictus", el libro es una excelente adición. Despre Mandela și echipa de rugby a Africii de Sud. Foarte motivant, despre iertare, despre curaj, despre muncă pentru alții, despre dăruire, despre încredere, despre vise. Playing The Enemy is a journalistic popular narrative of the impact of the 1995 Rugby World Cup Championship in forming a post-Apartheid South African nationalism, and the efforts of Nelson Mandela embracing white dominated rugby in order to avert a civil war. 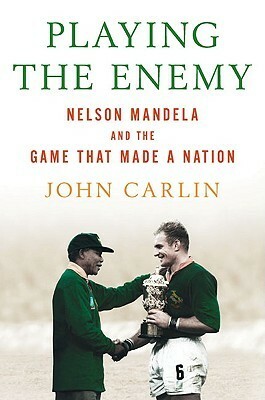 John Carlin, who is a longtime British journalist, centered the story on Nelson Mandela’s journey from resistance fighter, to longtime political prisoner who was the symbol of Apartheid repression, to the President of a fledgling multirac Playing The Enemy is a journalistic popular narrative of the impact of the 1995 Rugby World Cup Championship in forming a post-Apartheid South African nationalism, and the efforts of Nelson Mandela embracing white dominated rugby in order to avert a civil war. John Carlin, who is a longtime British journalist, centered the story on Nelson Mandela’s journey from resistance fighter, to longtime political prisoner who was the symbol of Apartheid repression, to the President of a fledgling multiracial state which could move either to factional war or forward as a nation. While an entertaining narrative written in a classical journalistic style, aimed for public consumption as opposed to academic study, its lack of sources throw into question some of its basic arguments, as one cannot confirm nor deny his assertions. Since the point of popular nonfiction narratives is to provide an entertaining story set in the real world, writers are free to take some liberties or exaggerate. Some of Carlin’s assertions, at the gut level, seem to be in this category, as well as his overall conclusions about South Africa’s problems since the 1995 game. As a book, it is an undeniable example of the connections between the importance of sports in forming imagined communities, and shifting notions of social progress. As Mandela asserted, sport have the power more than governments to break down racial barriers (3). Carlin argued that Nelson Mandela, while in prison, made an effort to know his enemy, and learned Afrikaaner history, culture, and language, and realized that rugby was what glued Afrikaaner people together. Mandela’s African National Congress (ANC) pushed for a boycott of all things South African, especially its national teams, and especially its national rugby team, the Springboks, whose green jersey colors were as much representative of Apartheid as the old South African flag and national anthem. When Mandela became President, Carlin argued that he realized how close South Africa was to a civil war, as heavily armed right-wing Afrikaaner militias and members of the military threatened to overthrow the newly elected ANC dominated government or carve out an Afrikaaner state. Though only 10% of the population, the fact that they were heavily armed and financed meant that they had the power to make or turn South Africa into a wartorn hellscape. Mandela sought to make a multiracial South African nationalism by pushing for black South Africans to embrace the same Springboks in the Rugby World Cup which had been heavily protested and boycotted. He met regularly with the mostly apolitical white members of the team, who by the end see him as much a part of their team as any other, and Mandela wears the green jersey and Springbock cap during the run. By embracing their former enemies, the teeth of anger at the loss of privilege is numbed since white South Africans see black South Africans rooting for their team. The final victory is one shared by nearly all South Africans. Divided into time periods providing the background, two thirds of the book is a setup for the 1995 World Cup, in explaining how the moment was a true crossroads, which could have led easily to war. The book, as many journalist narratives do, follow a number of individuals throughout besides Mandela. Justice Bekebeka was a longtime black nationalist ANC operative who was one of the few South Africans, he noted, that refused to embrace the Springboks, as he had forgiven enough. The embrace of the green jersey was something he could not do, which made him a lonely man on game day. Niel Barnard was a Afrikaaner intelligence director who had defended the old regime but realized it was untenable and began working towards transition to the new, which made him as a hard defender of post-Apartheid as he had been of Apartheid. Archbishop Desmond Tutu, who is a sort of a backdrop of a longtime Anglican bishop who pushed for nonviolent boycotts to fight Apartheid. Francois Pienaar is the captain of the Springboks, described as a typical apolitical Afrikaaner who always voted Nat (the Nationalist Party, the ruling Apartheid party dominated by Afrikaaners.) Linga Moonsamy was a former ANC guerilla who became the head of the Presidential protection unit, tasked with guarding Mandela. He was on hand as a stadium of 62,000 Boers, described as rednecks with khaki clothes, potbellies, and Budweisor drinkers, chanted “Nelson! Nelson!” and sang Shosholoza, the new South African national anthem, which had originally been a black protest song. The book quite well set up that scene, as since the mid 1980s, South Africa steadily moved towards war, as it sent the military into villages to suppress protest and revolt, and right-wing Afrikaaners moved to balkanize South Africa if the Apartheid state was untenable. By combining the symbol of Mandela with the symbol of Springbok, he helped create the post-Apartheid state nationalism. Carlin’s thesis is summed up nicely, “For decades Mandela had stood for everything white South Africa most feared; the Springbok jersey had been the symbol, for even longer, of everything black South Africans most hated. Now suddenly, before the eyes of the whole of South Africa, and much of the world, the two negative symbols had merged to create a new one that was positive, constructive, and good. Mandela had wrought the transformation, becoming the embodiment not of hate and fear, but generosity and love” (223). Mandela had that unifying quality, where he sought out human commonality, which he believed sports to be a bridge between people of vastly different positions and backgrounds. Besides lacking the academic rigor of having checkable sources, Carlin overplayed how much rugby united South Africa over the long term. While it certainly helped alleviate a critical period after the ascension of the ANC through the 1994 election, which met their basic demand of “one person, one vote”, one day of sports unity will not restructure overall racial bigotry, to say nothing of racial institutions, which will take at least a few generations to change. Carlin hinted at the bigger problems of post-Apartheid South Africa, that of deep poverty, the AIDS epidemic, widespread violent crime, and corruption as being the standard problems of any country as opposed to the racist brute of international relations, which seems to be somewhat of a cop-out. He never mentioned the extreme neoliberal embrace of the ANC, which embraced the IMF and World Bank’s edicts that it privatize as much as possible to bring investment to South Africa, which, as it has in much of the world, actually deepened the poverty of the country. Mandela, while a man of deep reverence and vision, is but one man, and it usually takes decades, if not centuries, to rectify systemic, informal oppressions without the violent birth pangs of revolution. Carlin’s work has become very popular after Invictus premiered, which is based on Playing The Enemy. It is a story, as Carlin related, that is easily transferable to a fictionalized narrative. The serious historian should be troubled by the lack of sources in Carlin’s book, yet one cannot deny that he captured a pivotable moment of unity and possibility within South African history. Where the academic historian may overlook this moment, the journalist may overplay and romanticize the same moment. Is this where the sports historian comes in, making the links between social, cultural, political, and standard histories? What lessons from journalism, besides writing well, can an academic take away? I fear that historians will often throw out the baby with the bathwater in dismissing books like Carlin’s, which are clearly very popular, even if it is rightfully criticized for sources that are not accountable, which private interviews seldomly are. The accessibility of works like Carlin’s, which is the best selling rugby book in history, points to the necessity of engaging with strategies that journalists use. The heart-lifting spectacle of South Africa’s first free election in April 1994 was, for Nelson Mandela and his followers, a triumph unimaginably sweet, but perilously incomplete. Mandela was keenly aware that his party’s victory, secured by a landslide of black votes, lacked the endorsement of alienated whites, and that whites retained sufficient wealth and weaponry to endanger his new democracy if they felt threatened. As John Carlin puts it in “Playing the Enemy,” paraphrasing Garibaldi on the birth of Italy, the election had created a new South Africa; now Mandela’s task was to create South Africans. This wonderful book describes Mandela’s methodical, improbable and brilliant campaign to reconcile resentful blacks and fearful whites around a sporting event, a game of rugby. The anti-apartheid movement had fought passionately for a world boycott of South Africa’s team, the Springboks, knowing that this, as much as economic sanctions and domestic unrest, would drive home to ordinary Afrikaners that their dominion was untenable. Now, in an attempt to reassure the defeated minority that they had a rightful place in the new order, Mandela agreed to host the 1995 rugby World Cup games in South Africa. More than that, he set out to transform black South Africans into Springbok enthusiasts by lending his personal charisma to the loathed sport and by mobilizing all races in pursuit of a world championship. A caveat is required: the premise that a single rugby game, even a championship game, could heal three centuries of racial division, dispelling accumulated terrors and hatreds in a magic Mandela moment, is romantic overstatement. South Africa is still a generation or two from racial reconciliation. But Carlin summons many witnesses, from ardent liberation firebrands to white racist bitter-enders, who testify that the 1995 championship match was a profoundly formative moment in the young country’s move away from the threat of civil war. By the time Carlin is finished, you’ll be inclined to grant him his poetic license. Carlin is a Briton who reported on South Africa’s transition for The Independent of London. (We were amiable colleagues at the time.) Now a globe-trotting writer for the world’s leading Spanish daily, El País, he is an industrious reporter and gifted storyteller. “Playing the Enemy” begins on the morning of the fateful game, in which the South Africans were underdogs against the gargantuan New Zealand All Blacks (so named for their uniforms). Carlin introduces an assortment of characters, some familiar, some obscure, victims and villains of apartheid, all of whom would feel themselves and their country transformed by the day’s end. We meet François Pienaar, the Springboks’ captain, a 6-foot-4 model of Afrikaner manhood who “carried his 240 pounds of muscle with the statuesque ease of Michelangelo’s David,” and Linga Moonsamy, a former anti-apartheid guerrilla who would be Mandela’s No. 1 bodyguard that day. We meet Niel Barnard, the former head of the sinister apartheid-era intelligence service, and Justice Bekebeke, who had spent much of his young life on death row for killing a policeman. We meet the irrepressible Anglican archbishop and Nobel Prize winner Desmond Tutu, stranded in San Francisco and looking for a bar that might broadcast the rugby game, and Constand Viljoen, the retired head of the South African Defense Force who became the leader of a white separatist resistance front. These and other deftly sketched characters make up both an audience for the big game and a gallery of South Africa, through which Carlin will recount the absorbing story of a country emerging from its cruelly absurd racist experiment. After that overture, the book steps back to its real beginning, in 1985. That was the year Nelson Mandela, then 21 years into a life sentence for conspiring to overthrow the regime, made his overture to the white government, beginning the long negotiation that would ultimately turn South Africa right side up. That was also the year activists scuttled a planned All Black tour of South Africa — which, along with riots in black townships and a rising chorus of international opprobrium, helped convince realists in the white government that they needed Mandela as much as he needed them. As the narrative steams forward, taking on interesting passengers and traversing some tumultuous history, the game of rugby becomes a recurring symbol. Carlin, who has worked in America and knows that rugby scarcely registers here, goes easy on rules and jargon while managing to evoke the drama of the game — “like a giant chess match played at speed, with great violence,” as he puts it. Mandela was, Carlin demonstrates, “a canny strategist, a talented manipulator of mass sentiment. His gift for political theater was as sophisticated as Bill Clinton’s or Ronald Reagan’s.” If “Playing the Enemy” were not so well written, it would deserve a place among the management tomes and self-help books that dominate business best-seller lists — a guide to leadership that plays to people’s better angels. Carlin has already sold film rights to Morgan Freeman, who seems born to play Nelson Mandela. Matt Damon is signed up to play the Springbok captain, and Clint Eastwood (a rugby fan) is directing. In those hands, there’s a chance the movie will do justice to the story. But don’t wait for the movie. Storia, politica, sport, sentimenti, il tutto in un libro dal taglio giornalistico, ma che ha anche il pregio di indulgere a parlare al cuore oltre che alla testa. Non ho visto il film, lo farò sicuramente, ma mi sono scorse davanti le immagini della prigione, delle manifestazioni, delle partite e sopratutto di quel 24 giugno che ha voltato una pagina importante di storia. Lo stile scorrevole, le immagini ben tratteggiate, la ricostruzione storica corretta. This review has been hidden because it contains spoilers. To view it, click here. Probablemente nada une más a la población que un éxito deportivo de su selección (sea cual sea el deporte nacional). Evidente, ¿no?. Pero... ¿hasta que punto?. Esta historia parece sacada de un cuento de hadas, porque ese punto fue evitar una guerra civil. John Carlin escribió la biografía más entretenida que he leído en mi vida. Desde dos polos opuestos; con Mandela en la cárcel recibiendo la visita del ministro de Justicia (preparando el camino de lo inevitable) y el increíble triunfo de los S Probablemente nada une más a la población que un éxito deportivo de su selección (sea cual sea el deporte nacional). Evidente, ¿no?. Pero... ¿hasta que punto?. Desde dos polos opuestos; con Mandela en la cárcel recibiendo la visita del ministro de Justicia (preparando el camino de lo inevitable) y el increíble triunfo de los Springboks en la final de la Copa del Mundo de rugby (ante la más poderosa de las selecciones) se nos va narrando, capa a capa, cómo un hombre que en su día abrazó la lucha armada sufrió una transformación en prisión que le hizo ver otro camino. Cómo supo perdonar a sus antiguos opresores y encontrar la única vía para unir a las dos razas bajo la misma bandera. Aún parece increíble la forma en que logró contagiar a la población de color su entusiasmo por el símbolo y el deporte de los Afrikaners, y cómo esta selección pasó de ser un equipo mediocre a batir a la mejor del mundo gracias al empuje y la necesidad de toda una nación. ¿Es poco?. Bueno, pues además ocurrió tan sólo un año después de que Mandela fuese elegido presidente de Sudáfrica en las primeras elecciones democráticas de su historia. A great insight into the events that led up to the 1995 Rugby Worldcup, uniting a nation under Mandela. For some reason, I expected it to be more about the Springbok captain Pinaar and rugby but it was actually a portray of Mandela's last years in prison and the events leading up to his release and then later the 1994 elections. Really appreciated the insightful portrayal of Mandela as a man who created a new nation with fantastically clear and shrewed mind and a heart full of grace and love. Fi A great insight into the events that led up to the 1995 Rugby Worldcup, uniting a nation under Mandela. For some reason, I expected it to be more about the Springbok captain Pinaar and rugby but it was actually a portray of Mandela's last years in prison and the events leading up to his release and then later the 1994 elections. Really appreciated the insightful portrayal of Mandela as a man who created a new nation with fantastically clear and shrewed mind and a heart full of grace and love. Fills you with awe of the man, seriously. The audiobook wasn't actually read by the narrator it was meant to be read (Saul Reichlin) but whilst not being South African, the narrator did a fine job pronouncing the Afrikaans, Zulu and Xhosa words/names. This is not just a book about a rugby game that made a nation, it's also about uniting white and black people in a nonracist attitude. It's a tale about forgiving, developing new ways of thinking. It's a tale about a great man who had the courage to do what nobody else had ever thought of doing, who achieved what nobody else had ever wanted to achieve. The book has an energy of its own just like Mandela had. This book has strenght in its words - so much so that towards the end I almost felt like I was a South-African rooting for the sucess of the country. What started as a great book took me a long time to actually finish. I mean there was no suspense or no surprise at the end, anyone who knows anything about rugby knows the All Blacks lost the world cup in 1995...or hence the Springbok won. Something just didn't sit right for me through the book, I honestly don't know much about Mandela or South Africa in general at the time, but this book didn't make me want to know more. I struggled to understand how the South Africian rugby team could not get t What started as a great book took me a long time to actually finish. I mean there was no suspense or no surprise at the end, anyone who knows anything about rugby knows the All Blacks lost the world cup in 1995...or hence the Springbok won. I struggled to understand how the South Africian rugby team could not get the protests they got when playing in New Zealand and Australia in the 1980s, or how a Africans pastor needed to go to France to figure out that blacks could be intelligent, but I guess if you live in a sheltered environment you might really not know any better. Ha sido una total sorpresa. Tardó un par de capítulos en engancharme pero no lo solté en cuanto lo logró. Brinda un análisis interesantísimo sobre los últimos años del apartheid, de Mandela como impulsor de un cambio en la sociedad y de la manera en que se construyó una identidad nacional unificada para negros y blancos. Todo ello ayudándose del deporte. En aquellos últimos años del apartheid, cuando Mandela acababa de salir de la cárcel, Sudáfrica estuvo al borde de la guerra civil en múltiples m Ha sido una total sorpresa. Tardó un par de capítulos en engancharme pero no lo solté en cuanto lo logró. En aquellos últimos años del apartheid, cuando Mandela acababa de salir de la cárcel, Sudáfrica estuvo al borde de la guerra civil en múltiples momentos, los políticos a cargo de las negociaciones lo eludieron por muy poco y ambas partes cedieron en puntos muy importantes porque tenían una visión de futuro. Pero para poder conciliar a blancos y negros después de aquellos oscuros años de discriminación tuvieron que construir un nuevo país, una nueva identidad en la que ambas partes se identificaran. I must apologize. Living in South Africa when you were let out of prison, I saw propganda on t.v. and assumed it must be true. Reading this book helped me to see how wonderful you really are. It really changed my opinion of you and I will be forever grateful. It really took me back to my time in the M.T.C. when they taught us "culture classes"-- courses designed to help us relate to the Afrikaaner culture and understand them better. I felt like they helped a lot and I was sad when they dropped Afrikaans from the M.T.C. It just goes to show you what happens when you reach out to people, really get to know them and try to understand them. I think you are unforgettable. Thank you for what you taught me.